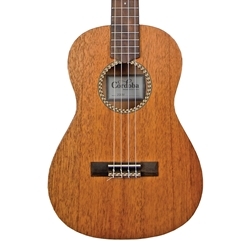 As Cordoba's first baritone sized ukulele, the 20BM features a solid mahogany top and mahogany back and sides, with a natural wood pattern rosette and satin finish making it an alluring instrument for the both beginners and ukulele enthusiasts alike. Baritone ukuleles are played in a variety of tunings. Cordoba baritone ukes come set up in one of the more popular tunings, which matches the top 4 strings on a guitar (DGBE). The strings used are Aquila Nylgut baritone uke strings, which include a wound 4th-D and 3rd-G strings, and nylgut 2nd-B and 1st-E strings.